The new improvised approach to promote school effectiveness has been poosible due to strong focus of Lokmitra on promoting Experiential Learning and constructivist approach to teaching learning, in pursuence with what has been suggested in NCF 2005 what has been made legal under article 29 of RTE Act (that describes the aim of education and quality of education). This along with growing appreciation of Dialogue, Effective group process has immensely helped the organization to abreast the challenge in improving quality concern in state government schools. More importantly, Lokmitra team got exposed to ideas and practices that revolve around promoting learning community. An eminent educationist Dr. BK Passi is supporting Lokmitra in this direction. Prof. Passi has been Vice-chairman of NCTE India. He has worked as UNESCO CHAIR of distance teacher education. Building on the idea of J Krishnamurti and that of David Bohm (the eminent physicist), Prof Passi promotes use of Dialogue in educational institutions for transformation of education system and education. Lokmitra also got exposed to the work of Prof Manabu Sato, of University of Tokyo. He has been engaged in the challenge to reform schools from the inside by visiting schools throughout the country twice a week, observing classrooms and working with teachers. Since 2008 when a few schools had miraculous result, many other public schools started embraces reform based on concept of learning communities. This has taken place in the background of government declaring crisis of public school education and so forth. To our surprise evolving work of Lokmitra was very much moving in that direction and with the knowledge of this work we find ourselves in much deeper clarity as how to promote reform in public education. So a summary of idea, analysis & practice of Prof Manabu Sato is being presented here as this is describes what we have learnt and what we are trying to practice. He says that it is a paradox that in Japan, under decentralization and deregulation teachers’ autonomy has seriously collapsed. It started in mid 1980s, when political and economic leaders started to distrust teachers. Teachers are assessed at one side by parents as consumers and taxpayer and at the other side by bureaucratic officers. Core of professional assessment should be peer evaluation. It is good that Lokmitra has already working to address this paradox. Some finer nuances have got added. Like preparing the case study of children’s experience with learning, school observation, action research for discussion in meetings of teachers in school. But team will be able to implement it only in next academic session. Teachers are not suitably prepared. In service Training is fragmented and top driven, detached from the reality of class room. There is little on hand support. Limited opportunity & urge for peer learning. Tradition of teaching practices among teachers overshadows their limited & disjointed knowledge of Theory of Learning. Administrative monitoring sends wrong signal of what is expected from them and generally demoralizes them. Teachers and other functionaries have Negative Attitude towards children and parents. Improvement in education system is slow and bogged in political, administrative complexities. Main purpose is realization of human right of learning and democratization of school organization. Not to pursue a “knock down” teaching or “a model curriculum”. Rather to guarantee right of learning of all the members and best way of learning. School as learning community is a place, where children learn together, teachers also learn together as educational professional, and even parents and citizens learn together through participating in school renovation. Collaborative learning at classrooms, collegiality at staffrooms and cooperation of parents and citizens with teachers are fundamental components. In order to fulfill this vision, students learn how to work together in classrooms, teachers build collegiality in their offices where they creatively challenge the issue of how to conduct classes and critique and learn from each other, and parents and citizens take part in classes and work jointly with teachers (classroom participation). School reform can start and progress just from within. However without support from outside, it cannot be continued. School reform is hard work of long revolution. It needs laborious commitments and long-term efforts and at least 3 years. Therefore, we must think school revolutionarily and change it evolutionally. Energy for reform is not generated from conformity but from difference. As learning occurs and is promoted in differences. We should struggle against all the sorts of conformity and of identity and respect for variety, individuality and singularity in learning at classrooms, school in-house workshops, and curriculum and school management. Central purpose of school reform is realization of learning possibilities of all the children, so that school reform should be facilitated with case method based upon observation at classrooms. Pedagogy have made great contributions to improvements in education, but school and classroom reform is part of social reform and also part of a cultural revolution, requiring theories from other disciplines as well from the humanities and social sciences. Learning is defined in learning communities as a practice of dialogue with the world in which one finds oneself, with others and with oneself. It is a cognitive (cultural), interpersonal (social) and existential (ethical) practice. Professional competence of teachers is redefined as an ability to reflect upon teachers’ own practices and to learn from each other’s practice, rather than just the capability of “rational application” of scientific knowledge and techniques. Schools are for public mission and accompanying responsibilities. Teachers are professionals who are responsible for carrying them out. They are responsible for fulfilling each schoolchild’s right to learn and for bringing about a democratic society. Public philosophy also means that schools are open as public spaces. It is a concept that schools and classrooms are open to everyone inside and outside and that ideas and views on life are discussed. The purpose of school education is to build a democratic society, and schools themselves must, therefore, be democratic social organizations. Democracy here means a way of associated living. Schools organized on democratic principles, each schoolchild, teacher and parent participates in their management as a protagonist with his or her own role and responsibility. Activities to teach and to learn require a pursuit of excellence (not in comparison with others). It does mean that we do our utmost and pursue what is best. Learning to stretch and jump. Peer learning system was promoted within Lokmitra so that not only for internal learning, but also to expose them to this methodology on how to effectively learn & equip staff with facilitation skill. Concerted effort with staff to enhance their understanding and capacity to dialogue with teachers, enabling Knowledge Construction. Effort to improve the dialogue skill of team to take up the issue of improving teaching practice, especially Hindi Language, with teachers. During May-June, in-house preparation was done and written materials to guide Teachers, SMC members & Staff was developed. Team was supported through weekly meetings. Shiksha Per Sabha (Meeting of Parents at GP/Ward/School) was organized in May-June to sensitize large parent body and encourage them to demand from School Teacher, SMC & PRI/ULB. Listening to what others have to say is the starting point of learning. Activity System provides opportunity so that each one is listened. The responsibility to fulfill each child’s right to learn in classrooms should be shared with all children, all teachers principal and parents. Children are organized in collaborative learning system in groups of 6-8 children, enabling learning from each other. Enabling schoolchildren’s active, cooperative and reflective learning. Teachers are expected to children’s responses toward learning. They are required to consistently listen & pursue creative teaching by spontaneously responding to children. Weekly meetings of teacher to discuss case studies based on classroom observation is at the heart of school management. Case studies should focus not on learning as experienced by children in their classrooms and about their learning from each other. Parents and teachers work together to create a better classroom, sharing responsibility for educating schoolchildren. Lokmitra is now taking up following Activity System (in next Slide) to Schools with encouraging initial response. Analysis of Problems and find solutions. Evolving and tracking the learning system of school through monthly meetings. Weekly Learning Session, reflecting on Case Work with Children and each others observation of teaching practice. Head Teacher ‘s Leadership for promoting Children’ Right to Learning. Each Class has children divided in Groups of 6-8 for collaborative Activity Based Learning. Children also taking responsibility for attendance and learning. Children from Each Group of Each Class collective meet every week for BAL MANCH. 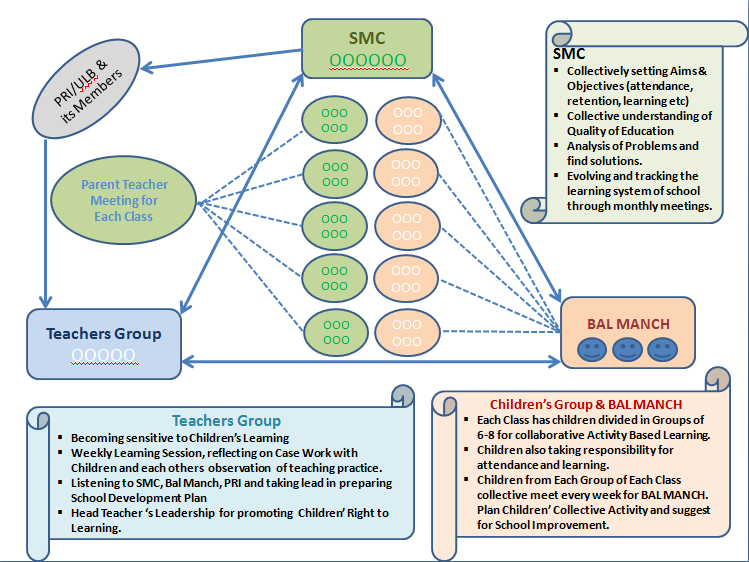 Plan Children’ Collective Activity and suggest for School Improvement. Parent Teacher Meeting for Each Class – This may takeplace every quarter and Parent Teacher can collectively try to understand the learning need of child. This will help in providing the child suitably learning opportunity, not only in school, but also at home.